ULTRA never ceases to amaze, delivering massive power to the people in unique and functional packages. The all new 3rd generation X-Connect or X3 brings ULTRA into a whole new class power supply...the 1 Kilowatt class! Few manufacturers have reached the 1Kw mark, but ULTRA jumps right in with the 1000 Watt X3 Modular Power Supply! So uh, why so much power? Glad you asked! The X3 is prepared to tackle even the brawniest of SLI gaming rigs. It features support for both SLI and Quad SLI, and even supports the new 8-pin PCI Express 2.0 graphics cards that draw a catastrophic 300W a piece! Workstations, graphic design, any situation that normal power supplies would succumb to a smoky doom, the X3 is designed to handle like a walk in the park. The X3 is ultra efficient too though, utilizing ULTRA's Energy Efficient platform for an 85% efficiency rating. Excess energy in ordinary power supplies is wasted away as heat, but with the X3 there is very little waste so your system stays cooler. This also means at any given power draw level you are using much less electricity with the X3! The X3 also utilizes an Active PFC ensuring your computer is only receiving the purest of power. What little heat the X3 does generate, a thermostatically controlled 135MM ball bearing fan jettisons quickly and quietly out the back of your case. Less heat equals better stability and reliability. In fact, ULTRA believes the X-Connect 3 is so reliable that they back it with a Limited Lifetime Warranty! The X3 utilizes sleek titaniumesque FlexForce cables with a modular interface allowing you to only plug in the cables you actually require for your PC. 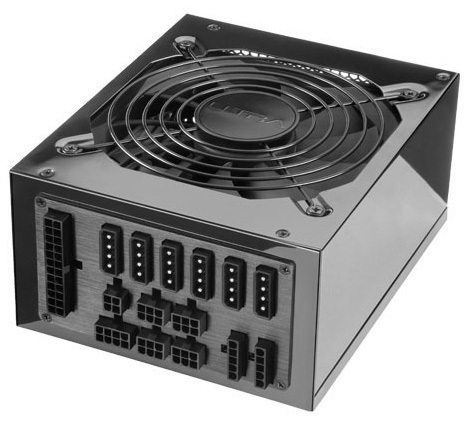 This keeps excess cabling to a minimum allowing for better airflow and glorious good looks inside your case. Quiet, efficient, excruciatingly powerful, and at a price that won't break the bank as much as other power supplies in this class, the 1000W X3 Modular Power Supply from ULTRA is a true player in this field of heavy hitters!